Well I guess it’s to be expected that when you spend about 13 months driving around the world, with already at least 50,000km driven across three continents, there are going to be complications with cars. In a rental car in the Salta region of Argentina I had a navigator that wouldn’t charge, and driving on an unsealed national highway I got a puncture without realising, damaged the wheel and had to pay $200 for a new one. In Germany I attempted to buy a used car far too cheaply, that turned out to be a lemon and lasted only 4,000km. Thus I was forced to rent a car in Milan that I would return in Palermo (Sicily), driving for 32 days across 11 regions, then fly back north for the next leg in the South of France. I accidentally booked the return date a week too early, and had to have it amended over the phone. I didn’t realise they changed the terms, so that rather than having unlimited km I was restricted to 4,800km, and was charged for an additional 332 km. With only three days remaining, the Fiat 500 broke down on the southern coast of Sicily, had to be towed back to Gela where I had to stay in a hotel for the night, then get a taxi to a town an hour away to collect a replacement rental car. So I lost a night and half a day of wasted time, and was charged significantly extra for a completely different contract, additional fuel and kilometres. I also wasn’t reimbursed in either office in Sicily as promised, so am out almost 200 euro, which I now have to try to get back from customer service. The lesson learnt from both rental car experiences is never trust Europcar, as they were the company in both cases. I should have known better. 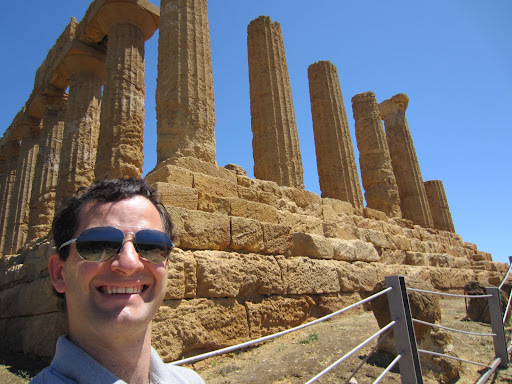 It was definitely worth the drive to Agrigento before my appointment, as the Ancient Greek ruins are breathtaking as the photo below will support. 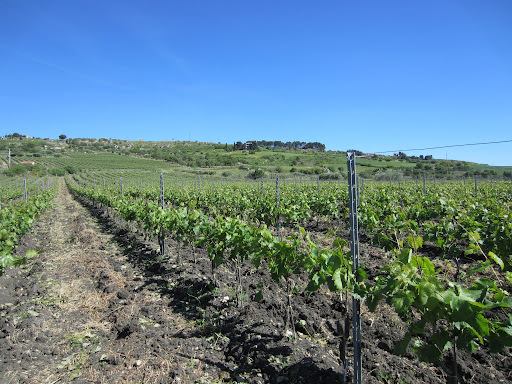 The province of Agrigento is very warm, dry and relatively flat, so ideal for viticulture where the majority of fruit comes from in Sicily. Morgante is another winery that was created in the boom of the late ‘80s and early ‘90s for Italian wine, when a former negociant selling wine in bulk made from purchased fruit, decided to purchase some vineyards and bottle their own wine. Antonio Morgante was the creator of the project, seeing the potential of the fruit and making a style of his own, and decided to build his own winery in Grotte, in the heart of the Agrigento region. Seeing the growing demand for Sicilan red wines, and particularly for the nero d’avola variety, he decided to work exclusively with this grape. Today the estate produces 350,000 bottles, but over 300,000 of them are for one of the (now) three wines. The Morgante Nero d’Avola was a wine that I sold back in Melbourne with great success. The top wine is the Don Antonio, a wine made using a careful fruit selection, extended maceration and barrel ageing and bottle age. Recently the winery has started to produce a white wine made from nero d’avola, an interesting idea considering nero d’avola is a red variety. The soils here are very dry and dark in colour, which are very particular to this part of the island, and limited irrigation is necessary but also difficult. The winery itself has recently expanded to cope with the increased production, and investment has gone into modern packaging and logistics parts of the winery. The wines are made very simply, with classic maceration techniques at high temperatures to extract plenty of tannin from the ripe fruit, and good oak to make the wines full, juicy and palatable for many markets. Working with only one variety in the region it is indigenous to means you develop a certain expertise in these wines, as long as you are making the right style for your market. Whilst the wines are very good, I wondered if they were reflective of Sicily? As a novice to wines from Italy, I am not in a position to answer, but they were not really my style of wines. Excellent value though. Click here to read my tasting notes. Click here to see more photos from Day Two in Sicily, Italy. On the next edition I continue further west to Marsala.